Chinese immigration in the 18th Century to work at various Indian port cities gives India its first taste of Chinese food. Then two cultures met with the best of their cultures and cuisine. In modern days at almost all major fast food joints, Chilli Panner is among the most sought items with vegetarians. Blend the garlic and ginger until smooth, adding a little water to help the blades turn. Separately, mix together the tomato ketchup, tomato purée, and dark soy sauce. Lastly, stir together the cornflour, flour and 4–5 tbsp water and gently stir in the paneer. Heat 2 tbsp of the oil in a large, wide frying pan over a medium heat. Add the paneer in a single layer; if it does not fit, brown it in 2 batches (don’t throw away the flour slurry). 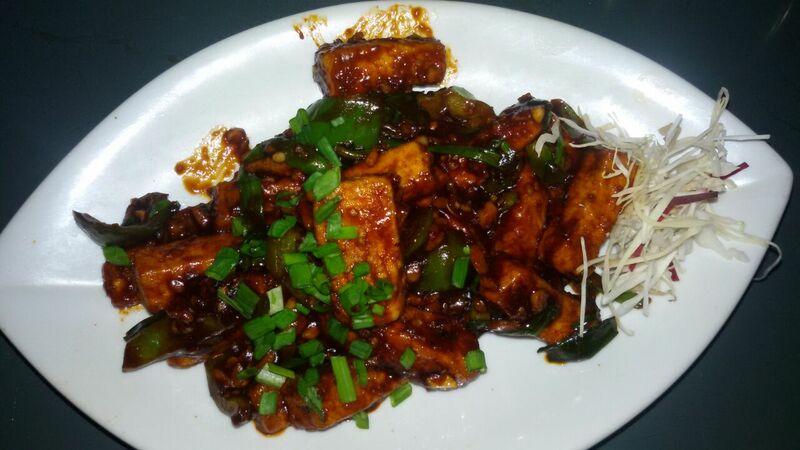 Fry the paneer, turning, until golden on all sides. Take out of the pan and place on kitchen paper to blot off excess oil. Add the garlic and ginger paste and cook over a medium heat until it is just starting to color. Add the onion, pepper, chilies and a small splash of water to stop the garlic from darkening too much. Stir-fry for 4 minutes or so, splashing in a little more water if the garlic is getting dark. Add the paneer, the ketchup mixture, vinegar and 2 tsp of the flour slurry, with a good splash of water from the kettle. Stir-fry until the whole thing comes together into a lovely sticky sauce. Add the spring onion, season to taste and serve.